A big day for Magellan AO today. As planned, we packed up our computers and the NAS and moved them to the summit. We first had to put a little work into the cable that runs power, data, and cooling to the NAS. This is the cable that needs to be wrapped up. Our computers and ASM electronics are in these nice wheeled racks. It makes us look like a rock band on the road. The first run to the top was our electronics racks and the CCD cooling system. This video shows the truck leaving the cleanroom. This was the practice run for the much more delicate NAS. 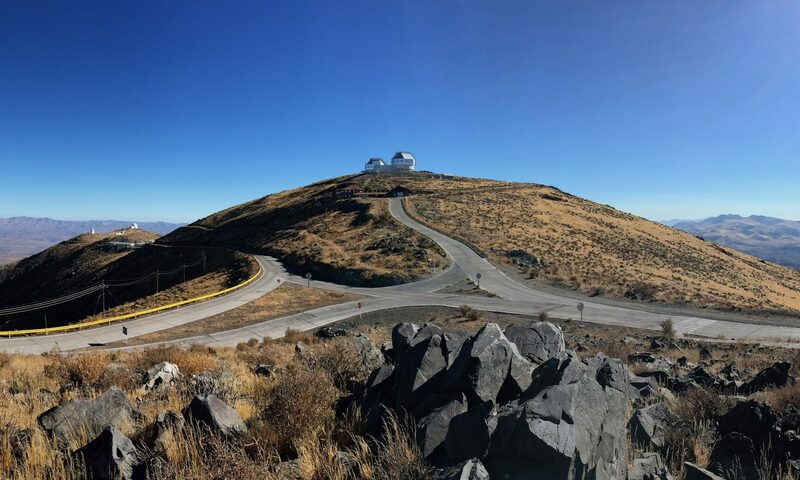 The Magellan telescopes with the Aux building in between. You can see the truck with our racks and pump just backing up. Click for high resolution. After lunch, we moved on to the NAS itself. We homed our stages, put on our dust covers, installed the electronics box lids, and threw it on a truck. Laird and Jared roll the NAS over to the loading dock. The team is making sure the kick stands on the cart will clear. The NAS being rolled from the lift onto the truck. The NAS makes it onto the truck. All strapped down, we're ready to start the drive. Jared, Laird, and Jason wait for the drive to start. The NAS has just left the building. The truck is very carefully backed out of the parking lot so no sharp turns are made. The NAS about half way up the hill. This video shows most of the loading process and the drive up the hill. This video shows the NAS making the last turn at the top. Just pulling in at the Clay telescope. Home at last. The NAS arriving at the Clay telescope. Finally. Unloading got a little tricky. The kickstands again. The NAS lives in the Aux building between the telescopes when we aren't using it. It's all tucked in for the night. The last thing we did was fire up the computers in their new home. We've been talking about whether our racks would fit in the equipment room for years. They do. Tyson, Jared, and Povilas discuss the finer points of caring for lifting straps. Our mascot supervised most of today's work from a high vantage point. But our friend couldn't bear to watch the drive up the mountain. Too scary. The other big news from today was the run’s first Guanaco sighting. Laird caught some movement on the side of the hill on our way to lunch, and Jason and I got as close as we could to investigate. A lone Guanaco watches us suspiciously. Click for high resolution. This is as close as it let us get. Based on last time, this probably means they'll be all over the place tomorrow. Click for high resolution.